La Primavera del Rinascimento (The Springtime of the Renaissance) is attracting a lot of attention. This ambitious show at Palazzo Strozzi in Florence runs from 23 March until 18 August 2013 (link). Its goal is to redefine our perception of the artistic culture of the emerging renaissance, focusing specifically on the role of sculptural production as a creative force in the early quattrocento. Donatello’s monumental bronze sculpture of Saint Louis of Toulouse is one of the many highlights of this exhibition—newly restored by Dr. Maria Ludovica Nicolai of Florence. Over the years, Ludovica has brought her skills and expertise to many celebrated masterpieces in bronze, including Lorenzo Ghiberti’s Gates of Paradise and Donatello’s David. Along the way, she has enjoyed a privileged intimacy with these and other works—developing unique insights into the artists’ methods and intentions. Leading restorers like Ludovica have much to tell us, beyond what we read in published technical reports. Three Pipe Problem is hence delighted to present the following interview, allowing an exploration of the unique experiences of a restorer in her own words. HN Can you explain some of the research that is required when a major restoration project begins? MLN The restoration of a work of art is always a complex operation that opens the way to a greater understanding of the work in question—from the scientific and technological point of view as well as from the art historical point of view. It is necessary, therefore, for a range of professionals to bring together their experience and expertise in the various phases of the process. The normal practice is to carry out diagnostic investigations before the restoration begins and then continue with ongoing checks as the intervention proceeds. This allows us to deepen our understanding of the material and technical properties of the work and to ascertain its state of deterioration, thereby optimising the methods for cleaning and safeguarding it. In the case of large-scale works, diagnostic assessment is now facilitated by the use of portable scientific equipment. These devices perform non-invasive analyses which allow us to obtain a vast range of relevant information. For an appropriate restoration, art historical research is also highly important since it allows us to gather data regarding the creation of the work of art and its subsequent alterations. 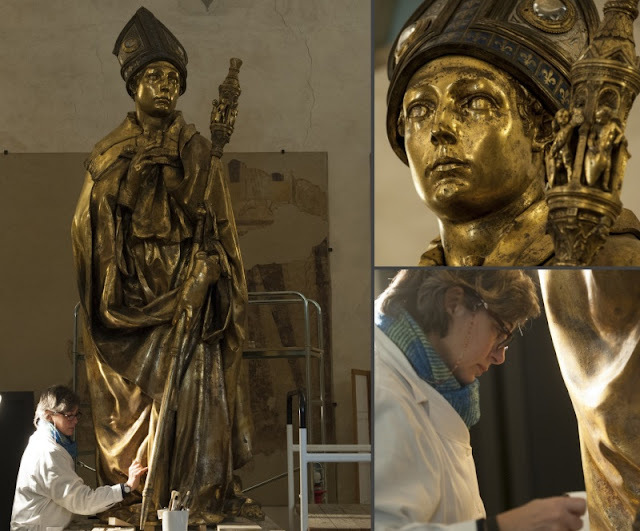 HN What were some of the challenges involved in restoring Donatello's Saint Louis of Toulouse? MLN The Saint Louis is a sculpture of large dimensions (2.85 metres high and weighing approximately 600 kilos). At the very outset, there was the complicated task of moving it from the niche in the wall of the Refectory of the Museum of Santa Croce where it had been exhibited, to the special restoration workshop (open to the public) that was set up for it in another room in the museum. Even dismantling the miter and pastoral staff was a significant undertaking due to the notable weight of these two pieces, but necessary in order to facilitate surface cleaning. Beyond such logistical problems, the real difficulty was calculating the cleaning of so extensive and smooth a gilded surface which presented highly varied states of conservation in different areas. To give an example: the cleaning was carried out with a chemical solution selected through testing, but after this cleaning, hard incrustations remained over the gilding, within the folds of the drapery and on the feet of the Saint. Since these had not been removed by the previous process, it was necessary to intervene with mechanical instruments and laser ablation—while fully respecting the gilding that lay beneath. HN Did the restoration of Saint Louis reveal any interesting information about Donatello's work methods? MLN The most evident aspect is the way in which Donatello conceived and executed the Saint Louis. With so large a sculpture, he was not able to gild it in a single piece using the mercury amalgam technique, so he cast it in ten principal parts along with a few smaller elements. He then gilded them separately and constructed the figure of the Saint by uniting these parts with large copper pegs. Since the sculpture was destined for a niche and would not be fully visible in the round, the unseen back is completely lacking. Analyses of the metal alloy revealed that the same alloy was not used for all of the parts. The relative percentages of the different metals are highly variable and the great number of inserted pieces along with many surface flaws demonstrate that the casting of the various parts was not realized perfectly. It is interesting to note the contrast between the originality of the idea of constructing the figure in various pieces, dictated by the desire to subsequently gild them, and the probable difficulty in executing the casts. Furthermore, we are struck by the refinement of the chromatic juxtapositions on the miter (blue enamels, gilded lilies, damascened silver and rock crystals) and between the miter and the rest of the figure which is completely gilded. HN You have now worked on two very famous Donatello works in Florence - Saint Louis and the Bronze David. Did the restoration processes highlight any similarities or differences in how Donatello (and his workshop) created these two pieces? MLN Donatello used the lost wax process for casting his sculptures in bronze and he relied on this same basic method for creating these two strikingly different works. While their diverse states of conservation were evident from the very beginning (the David and the Saint Louis had very different histories), restoration revealed their essential technical characteristics. The finishing of the surface of the David is distinctive, featuring a meticulous workmanship that followed the modeling. It was executed with notable deliberation, using instruments that left furrows of different widths and depths, probably to damp the reflections of light, thereby softening the forms. On the other hand, the surface of the Saint Louis was meticulously smoothed in order to accept the gilding. We can note that in both sculptures Donatello inserted different materials in order to create diverse chromatic effects. In the David, he emphasised the hair and the various decorations with gold leaf that contrasts with the dark bronze. In the Saint Louis, he ornamented the miter with blue enamel and silver that contrasts with the shining gold of the figure. The David and the Saint Louis are both characterised by evident defects in casting and the use of spot infill. It seems likely that Donatello was less interested in technical perfection than in the final result. HN Your previous restoration projects have included some of the most iconic works of Renaissance sculpture. Does the intimate contact you have with these special works enhance your appreciation of them? Can you give an example of a memorable detail you only noticed during restoration? MLN In the course of a restoration, one is in daily contact with the work of art, learning even the most minute details. These include specific casting techniques, defects that the artist left as they were or else repaired, refinements of detailing and much else. Even if the restoration is planned and executed according to scientific rules and criteria, the relationship between the restorer and the work of art often goes well beyond technical comprehension, instilling a sympathy that is long-lasting–at least for me. It is difficult to explain the feelings that arise when one is in front of a masterpiece. A great sense of responsibility is united with the privilege of touching that which the artist created and even imagining the personal sensations experienced by the artist. Achieving this sort of harmony with a work of art is not instantaneous, I would say. Day by day, as the restoration proceeds, there is a sense of increasing closeness. For me, for example, the cleaning of the face of a sculpture is a highly important phase that I put off until the moment when I feel ready to undertake it. Contact through touch is indispensable, because every imperfection—or indeed, perfection—becomes apparent to the palm of the hand. This is what happened to me with Verrocchio’s David, where the surface is finished so perfectly that caressing it gave me the pleasing sensation of touching silk! On the head of Goliath, I found fingerprints left in the wax and then transferred to the bronze—a truly emotional experience. Another interesting discovery was finding within the clay firing core of Giambologna’s Saint Luke a terracotta pipe, like those used to drain water in that period. This probably served to lighten the weight of the clay and to facilitate internal cooling during the process of casting. HN What advice do you have for students who may be interested in studying art conservation and restoration? MLN It is difficult to give advice because the metier of the restorer is very much a thing of its own, a multifacetted endeavor that requires the union of diverse personal traits. In addition to patience and sensitivity, great physical energy is needed. Curiosity and tenacity are required, along with practical sense. But the chief motivating force needs to be a deep passion that makes your heart beat faster when you are alone in front of a masterpiece. HN Visiting the show Springtime of the Renaissance at Palazzo Strozzi and seeing so many old friends together, must be a highly personal and even emotional experience for you. It would be a great privilege for us if you could help us see the show through your eyes. MLN When I entered the rooms of that show, I cannot deny that I experienced an immense pleasure at being surrounded by so many marvelous works of art and also an instinctive sense of psychological well being, just like being in the midst of a group of friends. Above all, my attention was drawn to the works in bronze, probably because they are indeed the ones that I know best. Right off, there were two old acquaintances: the two panels with the Sacrifice of Isaac, executed by Ghiberti and Brunelleschi for the competition in 1401 [for the North Doors of the Baptistry]. In the past, at the Bargello Museum, I had the privilege of disassembling and cleaning them—and thus, I was able to study the different techniques used by two artists to compose the same scene. Passing then to the next room, you find yourself in front of those imposing figures, the Saint Mathew by Ghiberti and the Saint Louis of Toulouse by Donatello. I remember the Saint Mathew when it was lying on a table while in restoration at the Opificio delle Pietre Dure in Florence. At that time, I was at the Opificio for the restoration of the Gates of Paradise [by Ghiberti] and I was thus able to observe the Saint Mathew from another point of view. I dedicated the most recent year of my life to the Saint Louis, so seeing it was more or less normal for me. I had studied it in depth, every centimeter of its surface. Now, I could look at it again to determine if my work had been a good one. Continuing on, there are the two Sprites by Donatello, from the Musèe Jacquemart-Andrè in Paris, where I saw them a few years ago, before their present restoration. Removing the dark varnish, I see, has given greater prominence to the working of the surface, to the refined detailing and to the remaining traces of gilding. Then there is the bronze Capital that Donatello and Michelozzo executed for the pulpit of Prato Cathedral and the magnificent Horse’s Headcast by Donatello. And then, moving along, you encounter more works by Donatello, Ghiberti, Luca della Robbia, Filippo Lippi—only to mention some of them. You cannot possibly tire of seeing and admiring these masterpieces because every time you stop in front of them, you notice a detail, perhaps one that you had overlooked before. And the more you observe these works, the more you comprehend the greatness of the artists who created them. Thank you to Ludovica Nicolai for her precious time, and fascinating insights into her work. Special thanks also to Dr. Edward Goldberg and Dr. Alexandra Korey for their translation of interview materials, and to Lavinia Rinaldi from the Palazzo Strozzi for images, information and resources related to the restoration and exhibition. Saint Louis images used copyright O'Mara McBride and Antonio Quattrone (miter and scepter shots). Spiritello image from Kermes vol. 87. See refs. Resources courtesy Palazzo Strozzi/L.Rinaldi. Kermes Vol 87. La Primavera del Rinascimento i Restauri. September 2012. Nardini Editore. How wonderful Hasan! Again you take us to new ground. These gifted professionals must be full of such wonderful experiences that are never shared because their training focuses on data, and not the experience or emotional impact of their vocation. Yet here we are, hearing these very thoughts from one of Florence's best - what a treat! Thank you so much to Ludovica for sharing these experiences, hearing your excitement at seeing Verrocchio's fingerprints, I felt like I was there with you - amazing! Congratulations, Hasan--and congratulations, Ludovica! Many thanks for these fresh and compelling insights! I hope that this interview will be the first of many, giving voice to restorers of various areas of specialization around the world. On Tuesday, I head back to Florence and I am more eager than ever to see this show. Ed G.
What a detailed and thoughtful interview! Thank you Ludovica and Hasan! As you mention, restorers know a lot more than gets published and have interesting stories to tell. This post was a great idea. I love seeing scientific analysis included in discussions of art pieces. As Ludovica has pointed out, there can often be a significant difference between the technical perfection and aesthetic perfection of the work. This provides a very interesting and telling perspective on an artist that is just not available from historical sources. This is so fascinating! Thanks Hasan for yet another insightful post. It is so refreshing to read the personal perspective of someone who has touched upon and worked on what the artist's' hands had touched upon. Ludovica, Thank you so much for sharing your profound experiences and giving us an intimate glimpse into these iconic works. Discovering Verrocchio's fingerprints! I feel privileged just knowing of their existence. Thanks again. Wonderful interview Hasan! Thank you. I just saw the catalogue for the show (as I live in London) and now as well as after reading this interview, feel I simply must go.